It’s the rumor that just won’t die, Apple is said to be actively testing an iPad with a smaller 8″ screen, according to a new report from Wall Street Journal. Officials at some of Apple’s suppliers, who declined to be named, said the Cupertino, Calif.-based company has shown them screen designs for a new device with a screen size of around 8-inches, and said it is qualifying suppliers for it. 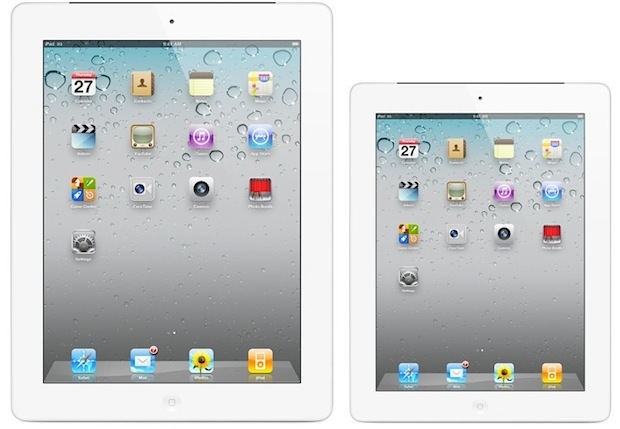 The smaller screened iPad is said to feature the same display resolution as the existing iPad 2 at 1024×768 pixels. The Wall Street Journal cautions that “Apple, which works with suppliers to test new designs all the time, could opt not to proceed with the device”, but suggests that Apple is continuously looking at the smaller iPads as a way to expand the product line in an increasingly competitive market. Many competing Android tablets have opted for smaller displays, most to limited success, although the Kindle Fire has become quite popular since it’s launch late last year. Rumors of Apple working on smaller iPads, or “iPad Mini“, have existed for quite some time, with a recent report from DigiTimes stating such a device could ship in the fourth quarter of this year. For the time being, the only new iPad you should expect is iPad 3, which is expected to be announced on March 7 with a retina display, 4G LTE, and a quad-core CPU. A smaller iPad would be great for educational usage. Well Personally I think an 8in Model would cause a lot of confusion in area. I see no advantage of 8in model compared to current iPad – Kids love the size of it now – being smaller just means that it harder to read.